Small bud vase. This was David Leach and Colin Pearson. Re: The Friars Pottery, Aylesford. Set up by David Leach and then managed by Colin Pearson, the Friary monks made most of the pots. 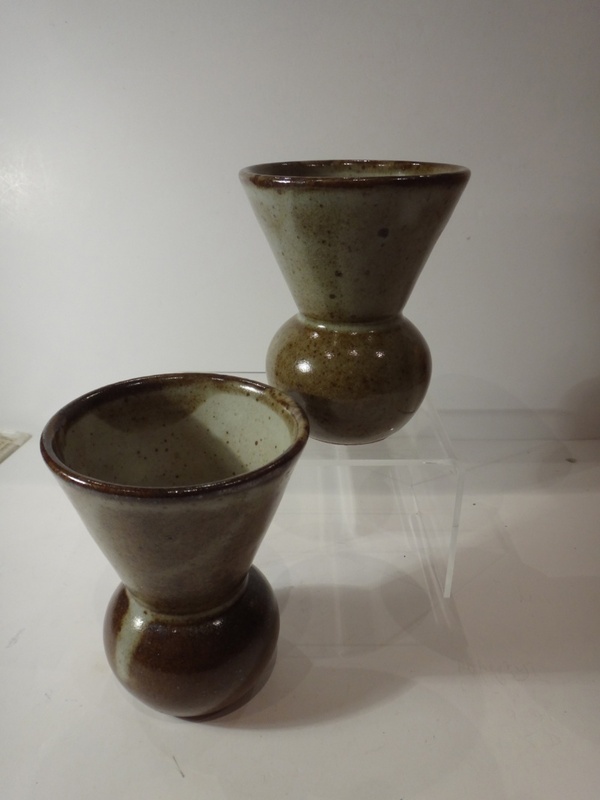 Functional stoneware with a characteristic (sometimes lustred) wheatflour coloured glaze was made in large quantities in the 1960s. The Pathe film archive has a short film about the pottery. Although the original idea was for the monks to make most of the pots this never really happened and over the years the pottery seems to have been run by a series of trained potters, who have been assisted to some degree by a few of the monks. Colin Pearson left the pottery to set up in Aylesford village in 1962 but production continues to this day, with the current incumbents not only running courses in pottery and selling finished wares but also supplying some of the young generation of "studio ceramists" with thrown blanks for them to decorate, fire and sell as all their own work! Coffee pot circa 1967. 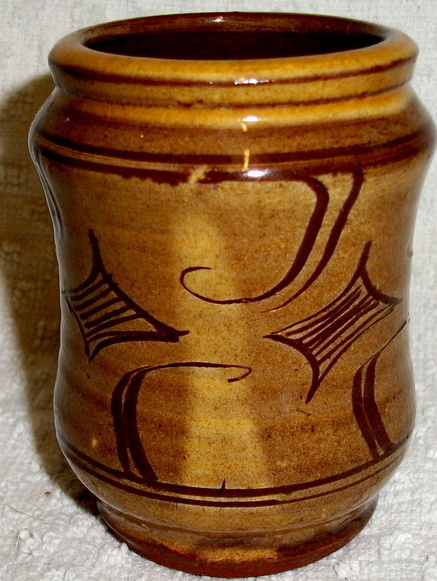 Lustre glaze only visible in daylight. I found another small tenmoku caserole pot in a charity shop for £5. As the one posted above. These seem not to be treated with much reverence...so I was thinking of cooking some goulash in it this evening. It was only a fiver and a tiny bit of lamb cost that now so why not. Has anyone tried their favourite pot in the oven? Any disasters? I'm assuming it will be fine in the oven at 180? I know that my earthenware tagine gets soaked it in water before use; to stop it cracking, but this is stoneware and glazed inside, with thet hole to let steam out..... looks about enough for two...... so am I good to go? A really nice piece of Aylesford pottery here with an interesting addition of two dots which I can not find a reference for under Aylesford, David Leach or Colin Pearson. This jug is 6.5 inch tall and 7 inch wide inc handle & spout and has a 3 star shield on the front. Does anyone know what the two dots in the mark denotes? There isn't much documented information about Aylesford and its potters over the years but I think that it is an early (might even be the earliest) mark. Although you haven't shown the base it is red earthenware isn't it? The shield would I imagine been done for a specific commission. Looking at the shape I wouldn't be surprise if David Leach had thrown it but it isn't really possible to give any firm attribution, as David is no longer around to give an opinion. Thanks very much and yes deep red colour to base. Bernard Leach used two dots after his LB mark sometime after 1921 till around 1940's I believe and it may have run over to David using them briefly - just a thought. At the time when David was at Aylesford and then starting his own pottery in Devon he and his father weren't on the best of terms so I think David would have avoided anything to do with his father. 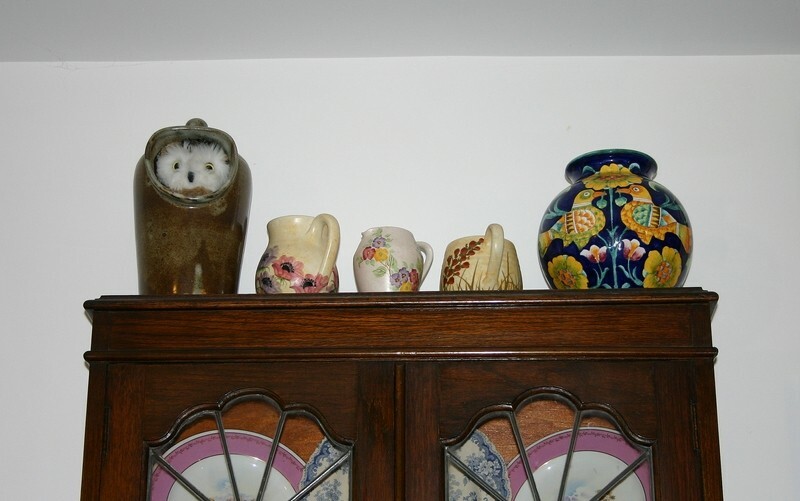 We have a large salt pig, it's kept on top of my wife's bureau bookcase (cabinet!). DON'T look in the pots! 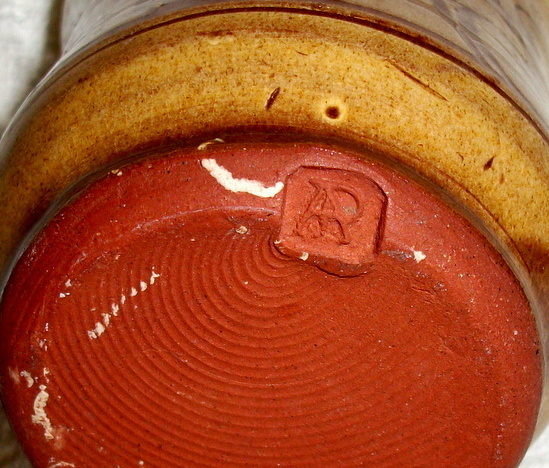 The early work from there was red earthenware and the mark looks right. You do see this type of thing being touted as being "early Aylesford by David Leach". David was there as a consultant early on and so it is possible that he could have made it but without his personal seal who can say. Colin Pearson would have been responsible for most of the output in those early days. The decoration looks somewhat amateur, which might point to that having been done by one of the friars. The original idea was that the friars would take over the pottery completely but that never materialised. Saw a larger version of these with a wavey rim earlier in the week (ie, a vase). Not an aesthetically pleasing design . 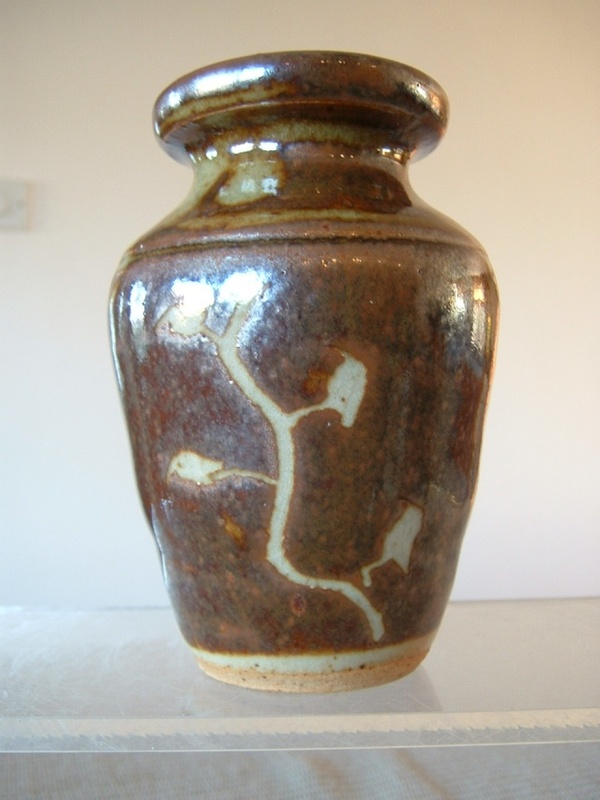 Ursula Mommens made vase in a similar shape but perhaps more flared, as she said that it made arranging flowers in them so much easier that more usual shapes. Very pleased to have found this today, but did have to squint at it for a long time in the low light at the back of the charity shop before seeing the marks.